The potential damage to bird and bat populations by large wind turbines is often used as an argument against more wind power installations, and serves as great fodder for comments here on TreeHugger when we publish something about wind technology. 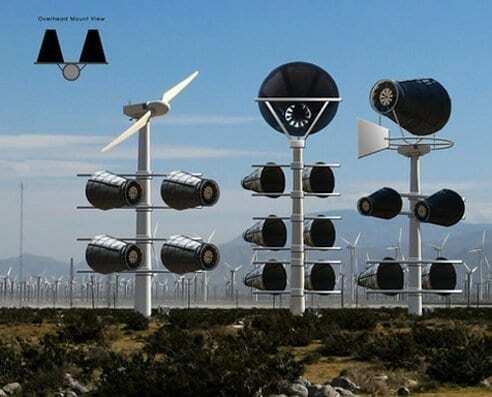 But there are other options for viable wind turbines that are claimed to be bird- and bat-friendly, including the Catching Wind Power (CWP) device, which will soon be tested, improved upon, and manufactured by Sigma Design. The CWP Compressed Air Enclosed Wind Turbine is the brainchild of 89 year old Raymond Green, who invented and patented his unique version of wind power generator. Green believes these units can be manufactured in sizes ranging from small personal-use/portable units up to massively sized units that can be installed at wind farms, and that they hold significant advantages over traditional turbine designs. The CWP turbine uses their patented Inner Compression Cone Technology, which is claimed to squeeze and compress the incoming air in order to be able to create more power at the turbine.